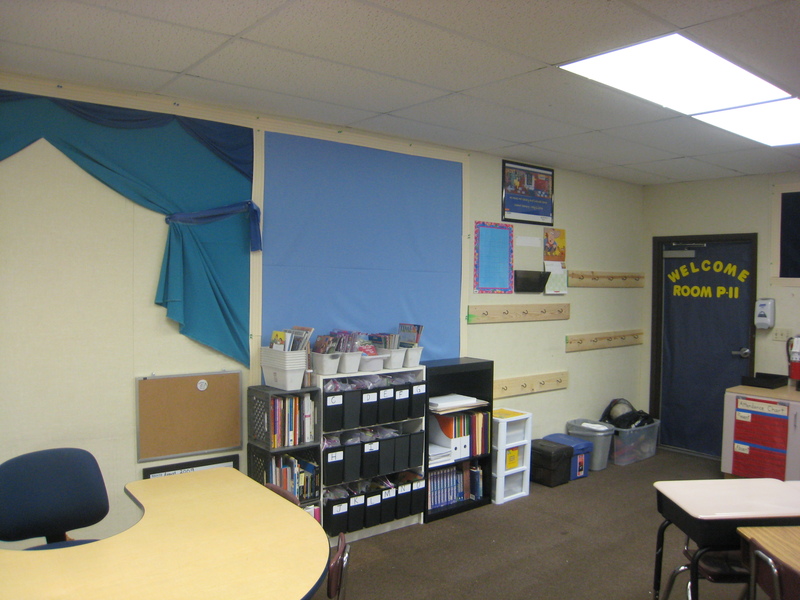 I noticed #4thchat today was talking about classroom layout, so I thought I would quickly write about mine. My classroom was packed and had many different areas until Jenna talked me into Feng Shui for my room. A basic bagua is basically how we arranged my classroom. That, and the other big part of Feng Shui – decluttering. It was a huge relief to get so much unnecessary stuff out of my classroom, or at least out of the way. In addition, I can see in every corner of my classroom from any spot in my classroom, which is important to me safety-wise. As you can see in the panorama (as though you are entering the classroom door), the classroom is basically wide open. That means within 3 minutes we can move all the desks to the walls for a morning meeting with all the second grade classes, we can move desks into “testing position” for spelling assessments and CSTs, or we could move the desks slightly to fit everyone at the whiteboard for an interactive lesson. The library is it’s own corner, with the aquarium next to it (both seem to be a calm/serene area for students to take a break if they feel they need one). The textbooks are now actually covered with fabric, as are the math tools near the rainbow rug. Makes the class feel even less cluttered, which seems to make classroom management even easier. There is a set of blue bins near the back table where I store any old assignments and current/future assignments. There is also an In Box for all their completed work and a Book Hospital for all those books that have been loved a little too much. Also, you might have noticed that there are not beautiful colorful borders around the bulletin boards, but just sentence strips. At the beginning of each year, I have my students write their goals for the year on sentence strips and put them around the most relevant bulletin boards in the classroom. That way, before any work has even gone up, students have ownership of the classroom walls. As you can see, these photos were taken before I painted all the desks with IdeaPaint and turned them (and the door and back table) into whiteboards, but it’s basically how my classroom looks now. And yes, no teacher desk. I’m either at the rug, the whiteboard, roaming the room, or teaching a small group at the back table, and all my supplies are stored in the drawers next to the back table, so I don’t feel I need a desk for any purpose. Again, my classroom has changed in the year since I took these photos, but for anyone wanting to peek inside a classroom, have a look. This entry was posted in Classroom Excitement, Whiteboard Desks and tagged bagua, classroom layout, Feng Shui. Bookmark the permalink. I just discovered your website and blog. It has such great tips! I love the idea of painting desks with IdeaPaint. I was wondering which version you would recommend purchasing. Did you also buy the primer? Did you buy from the IdeaPaint website of somewhere else? Yikes, I don’t think I replied to you Diana! I think they’ve revised their formulas recently and the Create version should definitely work. I did also buy the primer they recommend (I think Kilz2). I got it all through a vendor on Donorschoose, since I didn’t pay for it myself. Not sure if you’ve already tried this out, but good luck! Hello, I also wanted to paint my classroom desks, however I am reading some poor reivews. 😦 I have desks like yours Robert. Do I need to sand or prime the desks? I read more positive reviews on Rustolium paint… would you still recommend the IdeaPaint? Thank you! I haven’t tried Rustolium, but you could reach out to educators on Twitter using the #edchat hashtag or add me in the post (@pronovost) and I can direct it to other educators. I also think you could get a very small can of Rustolium and test it before you do everything. That’s what I did with the IdeaPaint. Let me know if you have any other questions… Good Luck!